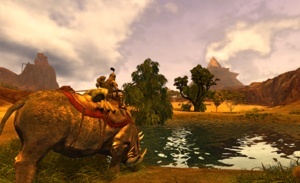 Age of Conan: Hyborian Adventures launched last week. I'm not sure, but I might be in trouble. MMOG trouble. I've been in this kind of trouble before, but only once. It was with World of Warcraft, during its open beta and for several months after the official launch. For a time, WoW claimed every spare moment I could wring from my busy work and family schedule. It effectively sidelined my other leisure pursuits. When I wasn't playing WoW, I was thinking about playing. I painstakingly managed my real-life responsibilities to maximize my hours in Azeroth, and spent my office lunch breaks poking around Thottbot, carefully planning each evening's adventures so as not to waste a moment of in-game time. I burned out on WoW early. Long before my gaming friends and associates did, in fact. After leveling a few characters up to the high 30s, I was done. I got tired to hoofing it across the landscape, tired of trying to get groups together, and tired of endlessly reusing the same attack combinations. Although the Burning Crusade expansion brought me back, once I'd brought a Blood Elf well into the 20s, I abandoned WoW again. So I'm not, I admit, much of an MMOG player. I missed the genre's early days on account of my reliance on hand-me-down Macintoshes during the glory days of Ultima Online and Everquest, and I merely dabbled in later releases like Guild Wars and City of Heroes. Even newer MMOGs like Lord of The Rings Online and Tabula Rasa haven't lasted more than a week on my desktop. I regret it, in a way. I feel like a bit of a pariah among my fellow diehard gamers. I'm the one guy who couldn't stick with it long enough to earn a mount or track down epic loot. I never went on a raid. The blood of the hero does not course through my veins. I wasn't Alpha enough to loot and pillage with the best. So I keep waiting for an MMOG that will hold my interest for more than a few weeks or months, that will allow me to fulfill my destiny, to conquer and destroy until I can proudly announce my accomplishments among my gaming peers. I think Age of Conan might be that game. I didn't bother with the AoC beta or early access programs, knowing full well that an unfortunate experience with an unfinished build might put me off the game completely, I did pay attention to the buzz, however, and the buzz was good. Varied combat, the internet said. A low-fantasy setting with (mercifully) no elves, orcs or dwarves. Beautiful landscapes. Forgiving game design. It sounded promising. Promising enough to buy, in fact.